The Yamb app for iOS is available in the App Store. It supports all the features that are available in the browser version, including full-text search across chats and messages. Click on the Chats tab. Choose one of the options: a private chat (with one person) or a group chat (where you can add multiple people, teams, or departments). Start typing the name of the team, department, or user, then choose the one you want from the list. If you are creating a private chat, it will start as soon as you choose the participants. If you are creating a group chat, find all the desired participants, then click Next. Then enter a name for the chat and click Done. You can also create a private chat on the Contacts tab. Find the person you want to chat with, click the name, then click Send message. Share photos, images, stickers, or a location on the map. To do this, click and choose what you want to do. To switch back to text, click . Click the name of the chat to view information about settings and participants. Leave the chat: in the list of chats, pull the chat to the left and click Actions. In the menu that opens, choose Leave and remove (the chat will be removed from the list in your app, but it will continue working for other participants). Change the name and description of the chat: click the text to start editing. Add or remove any chat participant, and assign someone as the chat admin (click next to a name). Limit the maximum size of images that you receive in chats. Yamb will automatically reduce the size of large images. Exit Yamb or switch accounts. Show notifications – Turn off this option if you don't want to receive any notifications for this account on this device. 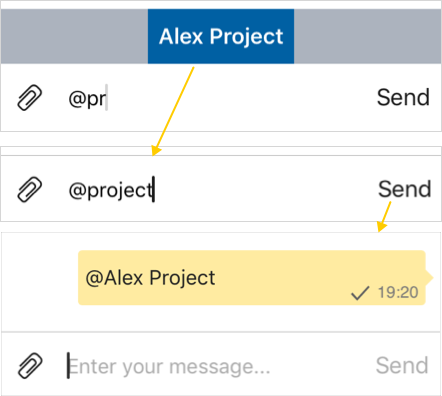 Message previews – Turn off this option if you don't want Yamb to show the text of messages in notifications (for example, this means that no one will see the content of your messages on a locked phone). New message – If this option is turned on, you will get an email about every new message in Yamb that you don't read immediately. Daily digest – If this option is turned on, Yamb sends you a daily email with the number of unread messages that has accumulated over the last 24 hours.